I was hoping to get through our What They Need series with no mention of his Bondsness. After all, practically ever other baseball website out there already has thirty versions of the apparently obligatory “Team X Needs Barry Bonds” article. Moreover, I don’t think I’ve ever written one even semi-nice word about Barry Bonds. Nope, from me, it’s all been HGH this and asterisk that. And at first, I was glad that all thirty teams were shunning him. But then something strange happened. Pity scuttled into my heart like a cockroach crawling into a warm, cozy kitchen. Jason Giambi and Andy Pettitte and Eric Gagne and two dozen other old juicers still get to play. And Barry Bonds has said he’ll play for the league minimum. Pro-rated. That’s about 22 million fewer pro-rated dollars than fellow Mitchell Reportee Roger Clemens commanded last season. And I admit, it made me see things in a new light. 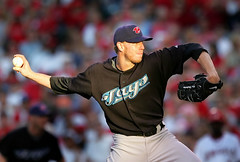 Which brings me back to the Blue Jays. A team with fantastic pitching and no offense. They rank 13th out of the 14 AL teams in runs scored. 12th in slugging. Dead last in home runs. Their team OBP isn’t actually that bad—they rank 6th in the AL—they just can’t drive anyone in. Part of the problem is that Vernon Wells earlier spent a month on the DL with a cracked wrist bone (and was still the beleaguered team’s RBI leader when he returned). Now he’s going to miss another 4-6 weeks after straining a hamstring in last night’s game. But their pitching, especially their starting pitching, has been solid–second in K’s, third in ERA, and fourth in opponents’ batting average. Plus, their staff easily leads the league with a 8 complete games—six for ace Roy Halladay, and one apiece for Jessie Litsch and Dustin McGowan. Alas, due to their somnolent offense, only 5 of these CG’s actually became W’s, thanks to a streak of three starts in which Halladay turned in a full game of work, but his team could muster only 4 total runs. Now the Jays are 10.5 games out of first, tied with Baltimore for the cellar of the AL East, while the top three teams in the league—Boston, New York, and Tampa Bay—duke it out for supremacy. Would adding Barry Bonds catapult the Jays into contention among that group? Probably not. But it would help them win ballgames, and it would give their fans a reason to keep going to the ballpark. They might even escape the wrath of the MLBiverse for signing the black-listed Bonds by virtue of being Canadian. Sure, I could sit here and recommend that they do something more useful, like sell off some of their studs for prospects. But this is JP Ricciardi we’re talking about, here, not Billy Beane. Come to think of it, maybe what Toronto really needs is a new GM. and Gagne? Gagne isn’t exactly breaking any records, he’s tanked big-time, so I think most people (i.e. me) feel he’s getting what he deserves right now (i.e. public humiliation in every major league ballpark in America). he’s kind of languishing below mediocrity. it’s not like he would have been remembered as one of the greatest pitchers of all time or anything. Technically, Giambi hasn’t admitted to anything. He’s just apologized for… something. Never said what he was sorry for. Actually Gagne was considered to be one of the greatest closers ever before the steroid allegations came out. He had the longest string of consecutive saves of any closer to ever play the game when he was with the Dodgers. He has definitely tanked in recent years but when he finished his streak in LA people were talking about him as possibly the best closer ever. It’s now apparent that isn’t the case. I don’t really see why Toronto would want to take on all the baggage that goes along with Bonds when you even pointed out he’s not going to put them in contention. It’s also likely that whatever fanbase they have in Toronto would be further alienated by having Bonds around, I have a feeling he would be even more scorned north of the border. The only teams that should consider adding Bonds are ones that would have their playoff hopes bolstered. Those are the only teams that could say that the reward of having him on the team would justify the stench that comes with him. To me the 2 teams it makes the most sense for would be Arizona and Tampa. Actually, Toronto doesn’t even have as good pitching anymore. Dustin McGowan and Shawn Marcum both went down in recent days with shoulder problems. McGowan in particular is a serious case – he has a torn rotator cuff and is out indefinitely. Actually, the Jays need a new division first. 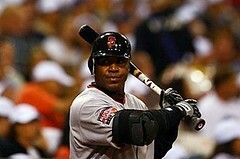 I also think Barry Bonds may have too much baggage to get through customs.